Studying abroad is an opportunity for a young mind to experience the joys and responsibilities of independence. Along with quality education, your child will also learn the checks and balances of life that will help them in the long run. It is a big step that demands your complete attention to take it to fruition. There are scores of details that need to be sorted and many-a-concern that need to be addressed. 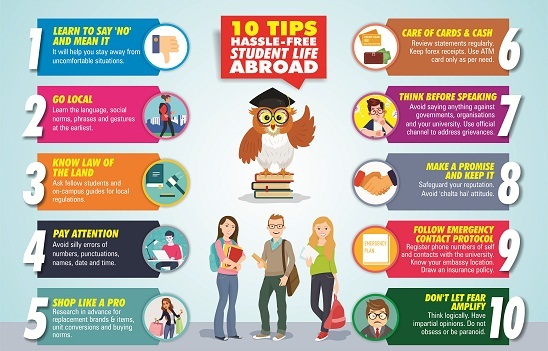 But the first step towards studying abroad is taken much before the actual admission happens. It starts with research. The search for the right college and the right course is the crux of this exercise. As a parent you should be involved in the process, providing guidance. Be a sounding board for your child but leave the ultimate decision to them. Please note that colleges in US need you to pay an application fee at the time of applying. The amount may vary from college to college. You can make these payments online through Thomas Cook’s forex and remittance services. Thomas Cook is the only non-banking organisation in India authorised to remit money abroad. Alternatively, you could visit the nearest Thomas Cook branch to get the proceedings started. Thomas Cook will also help you in getting student travel insurance for your child. We’ll see how, later. Here too you have the option of paying for the visa online. The experts at Thomas Cook will guide you at every step of the way through the entire process. You are assured of complete transparency, security and confidentiality. They will ensure that your child follows the step-by-step procedure correctly and leave nothing to chance. Once the online visa form is submitted, you must pay the visa fees online before the interview is scheduled. Please note that these fees are non-refundable. Make sure your child carries a printout of the completed visa form to the interview, along with other documents. Thomas Cook will set up the biometrics and interview appointments with the embassy. Once your child makes it through the interview successfully, their passport will be stamped with the visa. Congratulations! Now that you child has their college acceptance letter and their visa, it is now time for the next preparations. There’s your child’s accommodation and other daily expenses to consider. But even before that make sure that you buy student travel insurance for your child. The student insurance from Thomas Cook will cover your child in following cases. That covers your child’s insurance. As far as taking care of your child’s day-to-day expenses, you should give your child a prepaid forex card. Yes, they can have some cash handy for smaller expenses, but a prepaid forex card is the best way to carry forex safely. The Thomas Cook One Currency Card will be a useful companion to your child abroad. This particular card is valid and is accepted in 200 countries around the world. But the benefits don’t just stop there. The other card from Thomas Cook, the Borderless Prepaid Card will also guarantee the peace of mind for you and your child. It has all the convenience and similar safety features like the One Currency Card with one additional feature. It can take up to 9 different world currencies in one card. A very useful feature if your child has to travel to different countries as a part of their course. This way you will be ensured that your child concentrates fully on their studies without having to worry about money. With all these preparations in place, you can finally be assured that your child is ready to take their first steps towards a better education and independence. Thomas Cook will be there at every twist and turn to guide you and your child along on this journey that will lead to that penultimate bittersweet moment when your child departs to begin a new journey. One where they are in the driver’s seat.